Carol A. Ullmer, 88, of Dayton, OH died 8:25 a.m. Saturday March 9, 2019 at the Village at the Greene. She was born October 3, 1930 in Dayton, OH to Chester and Cloia (Redman) Studebaker. On October 27, 1951 she married Walter E. Ullmer at the EUB Church in Dayton, OH. 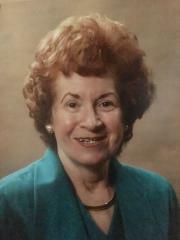 Carol was a graduate of Roosevelt High School (Class of 1948) and attended Sinclair Community College. She worked at Wright-Patterson AFB in Fairborn and later at the Fraze Pavilion in Kettering, Nutter Center at Wright State University and as contractor for Elite in the Meijer Stores. Carol was a devoted wife, mother, grandmother, sister and a friend to many. Her remains have been gifted to the Boonshoft School of Medicine at Wright State University. A Celebration of Life in her honor is scheduled to begin 2:00 p.m. Saturday March 23, 2019 at Corinth Presbyterian Church 4269 Corinth Blvd in Dayton. The Rev. Herbie Miller will officiate the services. Private family burial will take place at the Beaver Cemetery in Beavercreek, OH.